Let's say you're hanging out with friends and want to play a quick game. You're obviously the discriminating type, having picked up this box to read the text on the back of it. And, I must say, you're quite attractive too. But enough about you. You wanted to play something fun and light. 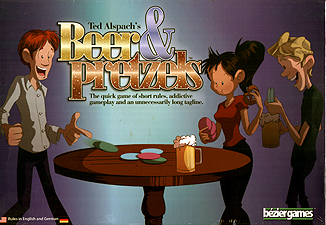 Beer & Pretzels lets you throw coasters and get money for doing it. How cool is that? Pretzel coasters give you money based on the type of pretzel. Beer coasters double your money. And Napkins clean up the mess by covering up other players' Beer and Pretzel coasters.